Re: No USB boot option? hmm. It seems I do not have a usb boot option on the Y580 ? 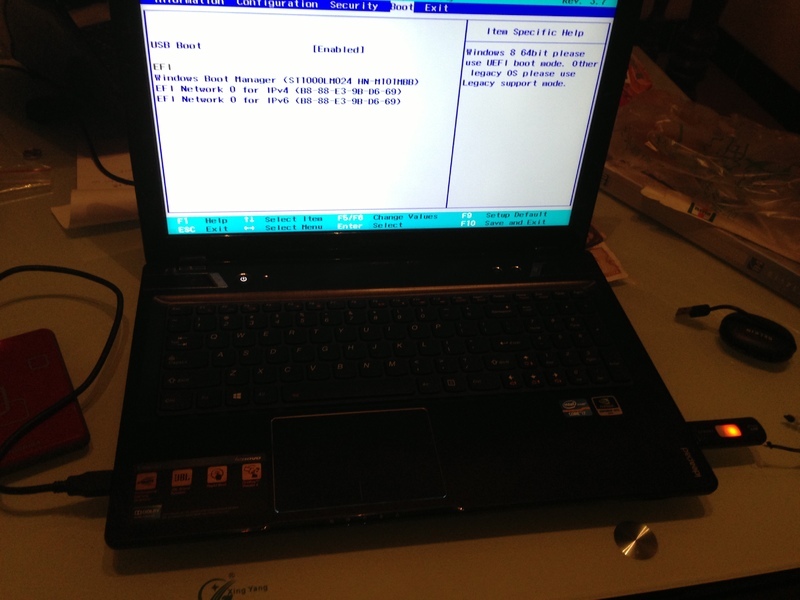 Historically, Lenovo cripples its BIOS. it does have a usb boot option. Maybe it's an old thread, but I thought it was useless to open another thread. I just bought an Y580 on december, with win8, bluray, etc, BIOS version: 5DCN90WW (V8.01), and it doesn't recognize at all any USB device during boot. I tried to put the USB pen on every usb port, from a restart and from a shut down, but nothing. Even the boot manager with F12 doesn't recognize it. Did Lenovo blocked the BIOS of what? Because I think it's unbelievable that I cannot boot from nothing else but the Windows Boot Manager. Or is it a problem of Win8? 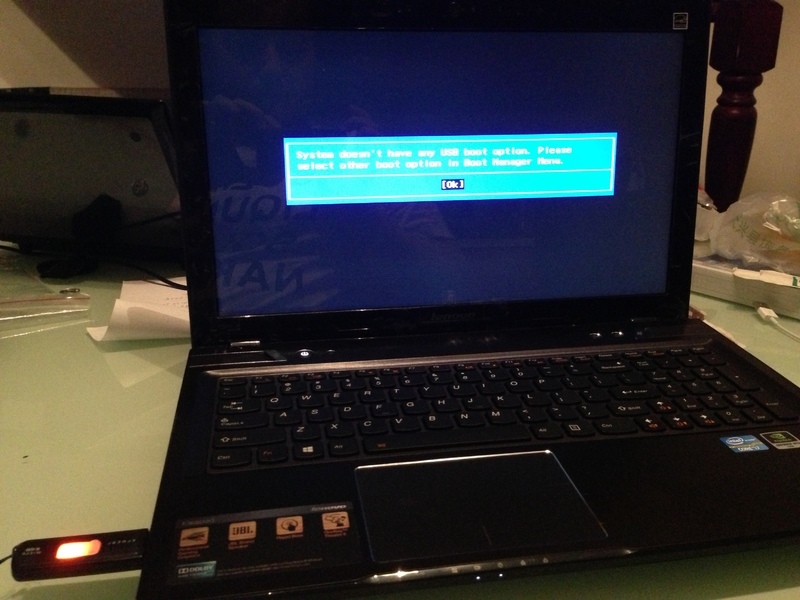 Here's a pic I took to show you guys that the BIOS doesn't see nothing as external. Try going to BIOS and tuning off Secure Boot. You may also need to set the mode to UEFI + Legacy. Boot Mode just has UEFI or Legacy Support, but no UEFI + Legacy. Is it normal? This is the message I get from Windows when I try to launch the USB after the Shift + "Restart" process. "System doesn't have any USB boot option. Please select other boot option..."
After putting Legacy Support (leaving UEFI first) now it seems it can read the USB pen on boot. i know this is a old thread . but i had the same problem , can boot from usb only in legacy mode , no option to boot from a usb in EFI system . secure boot is off . no option as uefi+legacy . i hv installed ubuntu in legacy mode so cant boot into windows when in legacy mode . when i go bk to efi , i cant boot into ubuntu (which is installed in legacy mode ) bios updated . help plz . Actually, there is a solution that works. This worked for me. I was able to boot from the USB windows 10 installer.